Very Hot air-mass and dry winds until isolated thundery showers Friday and Monday. Lighting is worry if Virga Thunderstorms case grass-fires. 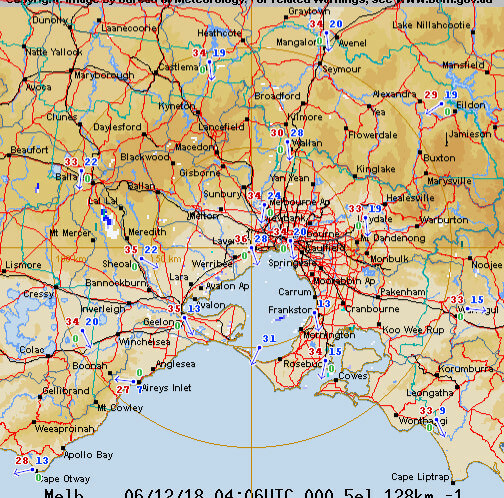 Then Melbourne Cup isolated showers with clean SW winds. Number of aircraft online for the next few days. Also Night Aerial firefighting training is occurring tonight, this year we will see 2 aircraft able to work at night on direct attack for the first time anywhere in the world. These aircraft will be based at Mangalore and Colac and will only fight fires which have been worked on during the day giving crews time to survey the area in daylight first. All are listed as not yet under control, interestingly they were started by lightning around 7am but didn't flare until round 2pm, they had aircaft check the area in the morning but nothing was found at that time. Currently 6 aircraft are attached to these fires with 2 more to head up tomorrow. This Watch & Act message is for Carlisle River. This Watch and Act replaces the Advice message issued at 3:00pm. There is a grassfire at Carlisle River that is not yet under control. Staying close to a building you can shelter in is the safest option as conditions can change suddenly. seeing as our fire season is having some time off, QLD has 3 Emergency warnings at the moment and 3 Advice Warnings. I don't know if we have already sent crews up already but my station has been asking for a show of hands should we be called upon. I also saw the 737 fire bomber had filed for a flight plan to Rocky a day or two ago. I hope it has stayed up there. Yep not good up there, think we are sending up from crews tomorrow. Large increase in state airfleet today with most of the fleet active from today including the skycrane based out of Essendon. Also big training day in Colac today for aircraft so if anyone is in the area you may see fire bombers and choppers flying around. Some of the strikes currently to the east of rainfall will hopefully get mopped up as the front travels to the east, fingers crossed on that one! 3mm in Sale and steady rain atm. Looks like most areas probably got enough rain to prevent anything from starting, aircraft are up checking the Mallee area at the moment, recce planned for Gippsland/North East this afternoon, highest risk of anything prop in the NE as totals look less up that way. Always the risk something will pop up over the next few days as it warms up and drys up with a tree still smouldering. Tomorrow, Fri, 7 Dec 2018 has been declared a day of Total Fire Ban in the Mallee, Wimmera and Northern Country district(s) of Victoria. Update: Major Spotting up to 1km, make strike teams atleast 4, numerous homes under threat, request large air tankers. This Emergency Warning is being issued for Buninyong, Scotsburn. There is a bushfire in the vicinity of Devonshire Rd and Nashs Rd Buninyong that is out of control. The bushfire is travelling in a southerly direction towards Brennans Rd. This message is for you if you are at south of Devonshire Rd. Now Make Strike Teams 10 on above, thats 50 trucks. Logansi. Be a fair nor wester blowing out that way to?? Out-of-control bushfire burning near Ballarat, Victoria. ANSWER is how did fire started by careless people. 9 registered (willitrainagain, Anthony Violi, Mcbobbings, Wrasse42, Farra, Homer, mysteriousbrad, ol mate, Sandbank), 58 Guests and 3 Spiders online.